Many designers have opted to semi-integrate feedthrus by soldering feedthrus directly into the housings. 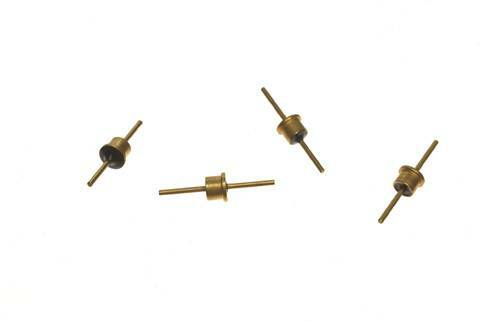 The solder-in feedthrus are available in a glass forward or reverse seal. Many designers have opted to semi-integrate feedthrus by soldering feedthrus directly into the housings. The solder-in feedthrus are available in a glass forward or reverse seal. This feature offers improved hermetic qualities to environmental conditions. Corry Micronics offers the industry standard .156 at the flange, as well as a wide range of capacitance values. Cost-Effective - Resin sealed filters provide environmental protection at a minimal cost. Design Flexibility - A vast array of solder-in bushings are available including a variety of circuits: C, L, & Pi.